Welcome at the airport and transfer to your hotel. In the afternoon you will enjoy a private tour visiting four distinct neighborhoods and plazas of Buenos Aires to learn about the city and its people, commonly called “porteños”. Lodging at Hotel Intersur Recoleta or Hotel Pulitzer or similar for two nights. Flight to El Calafate. Reception at the airport and Private transfer to El Chalten (car with driver/ about 3 hours drive), arrival and lodging at Hosteria Senderos, Hosteria Infinito Sur, or similar. Breakfast. 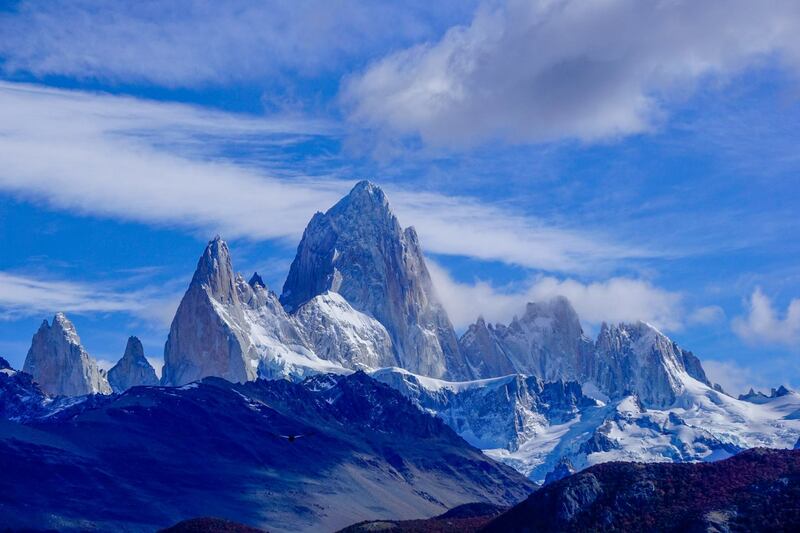 Today you will enjoy a full day private trekking excursion to Laguna de Los Tres including Piedras Blancas Glacier and base camp Fitz Roy. It is about 4 hours one way(7 miles each way). Moderate. Level difference: 700 mts or 2,100 feet. Maximum height is 3,400 feet above sea level. You will enjoy unique views!. You may also reach Laguna Capri and return if you prefer a shorter hike and you will still have a great experience and marvelous panoramic views. Picnic lunch during the excursion. Lodging in El Chalten. (B,L). NOTE: This is a private excursion with mountain guide so you may adapt it to your preferences. After breakfast you will depart to visit Los Glaciares National Park. This park of 600.000 hectares (2,300 square miles) has thirteen glaciers that flow into the Argentino and Viedma lakes. Perito Moreno Glacier, is one of the few glaciers in the world that is still progressing. It is only 500 ft above sea level, which makes it very accessible, allowing one to stand in front of a mountain of ice that measures 60 m (180 ft) by 5 km (2.5 miles). The constant fall of huge towers of ice from its walls and into the lake is an unforgettable spectacle. Trekking Expedition: You will board a boat to cross the lake. You will land on an isolated beach and trek for about 1 ½ hour on the glacier while enjoying a magnificent landscape of ice formations in different shades of blue, crevasses, streams and small lagoons. (Not additional equipment, or previous experience required. Age limit: 65). Boat and trekking excursions on the glacier, and Estancia are shared with other passengers. NOTE: The ice trekking “Minitrekking Excursion” on the Perito Moreno Glacier has an age limit of 65. If we replace that excursion for a boat excursion the tour cost will be $140 lower per person. The rest of the day in the park would be as planned. Domestic flights are NOT included in the tour price. COST for the flights Buenos Aires/ El Calafate/ Ushuaia/Buenos Aires will be about $800. Price may vary.